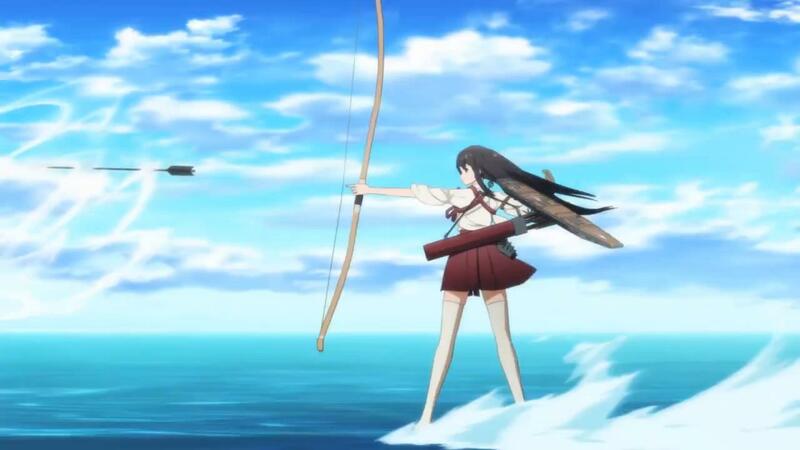 From the hit anime Kancolle produced by Diomedéa, based on the game Kantai Collection by Kadokowa Games, Akagi is the anthropomorphization of the Japanese aircraft carrier Akagi. So for those of you who do not know what Kancolle is its basic premise is that high school girls are the manifestation of WWII Japanese battleships that are fighting the mysteries “Deep See Fleet” that look like a cross hybrid human/monster/battleships. So Akagi is a representation of the Japanese aircraft carrier Akagi, commissioned on 25 March 1927. The Akagi was originally meant to be a battle cruiser but after the Treaty of Washington (which limited the number and size of naval vessels to be built) she was stripped of her guns and made into an aircraft carrier. This is reflected in the anime Kancolle by Akagi acting with what I interpret as “the heart of a warrior.” She was originally built for the front line but forced to take a supporting role as a carrier. I appreciate how Akagi is depicted in the Anime as a leader seeing as she was the flagship of the first 1st Air Fleet (known as Kidō Butai). The Akagi fought from Pearl Harbor to Midway, where she was damaged beyond repair after a dive bomber hit her while reloading and refueling planes below decks. Thankfully in a divergence from historical accuracy, Akagi survives the battle of MI in the anime to return for season 2!